A couple of weeks ago, Alischia from Lacquerhead Polish offered to send me some samples to review. Don't they look CUTE with their little bows ? Now, I was very relieved she didn't send me a white :) but oh look, there's the obligatory green and HOLY MOLY a lemon ??!! Yikes! Just before we start - one or two of the photos show slight lumps or bubbles. I just want to state up front that this is not due to the polish. 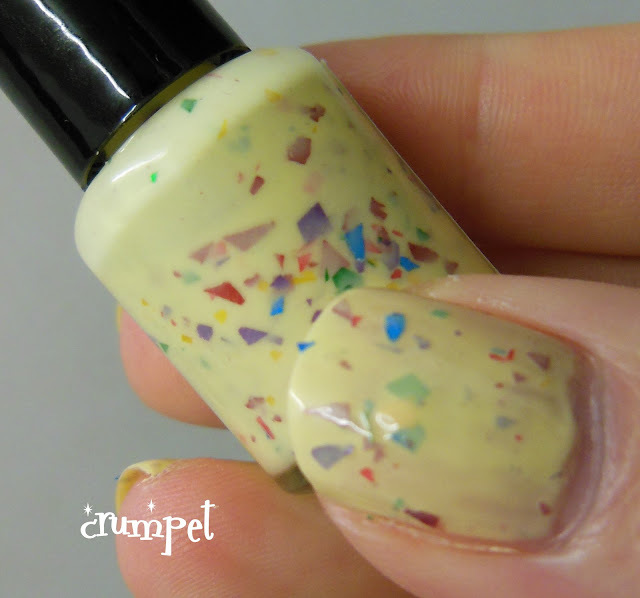 I've been using PVA glue for the base for my glitter polishes, and it's not always totally easy to control, hence the odd unevenness. Ok, can you guess which one I chose first ?? Yup, I am sooooo obvious, I went straight for Zombie Kisses. 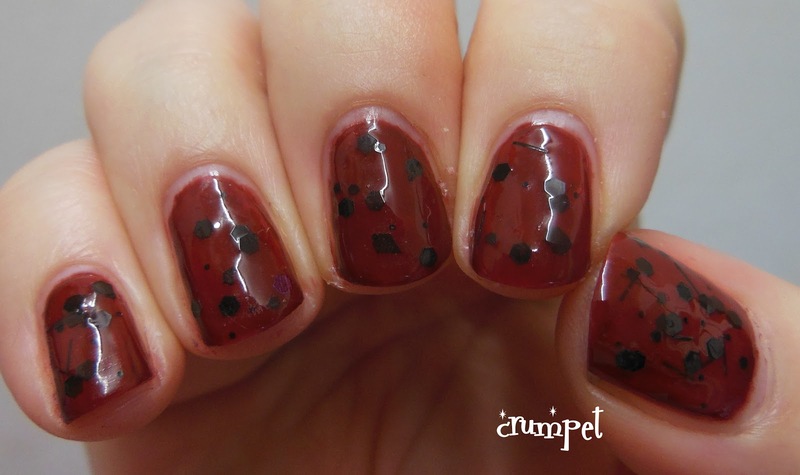 This is a dark red jelly, packed with black glitter. 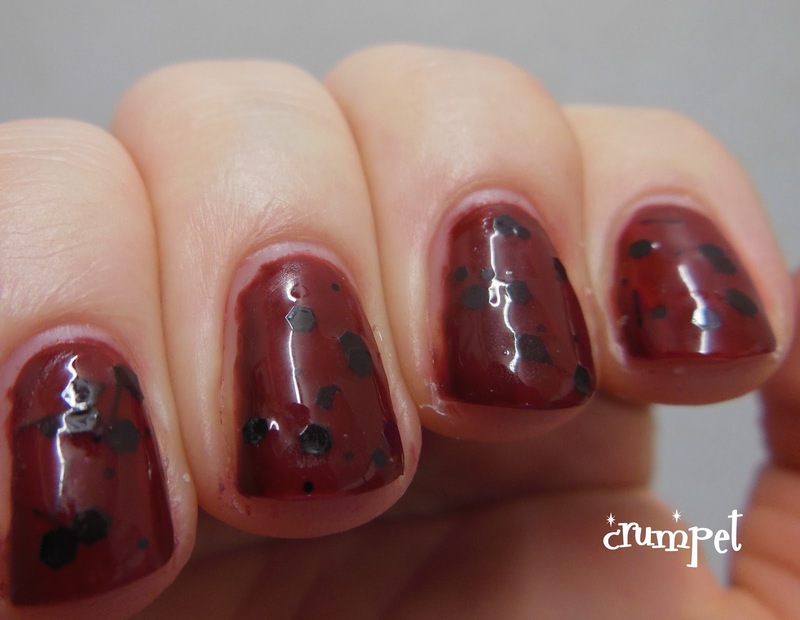 I wasn't sure how opaque it would be, so I layered it over Zoya Cola, which actually matched the tone of the polish really well. 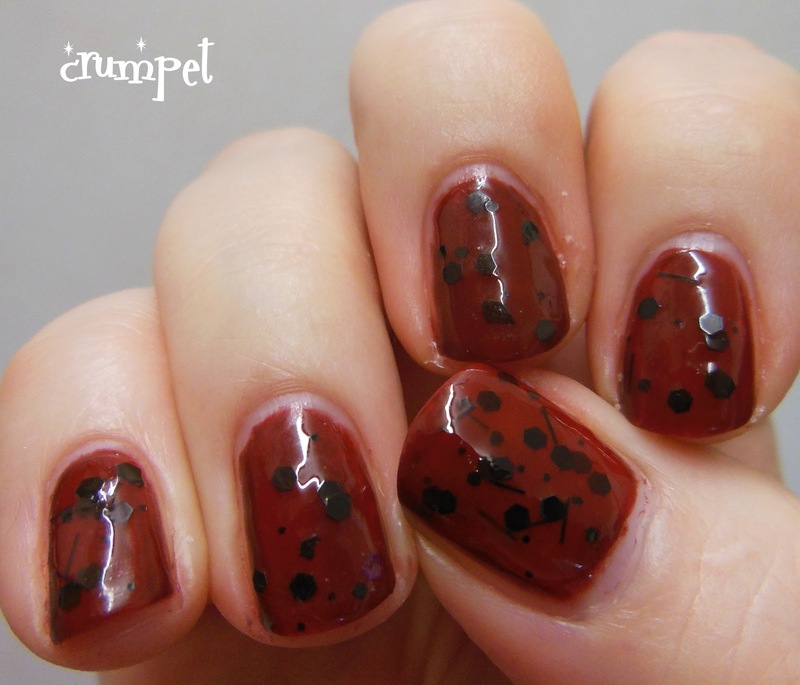 I adore how this looks - a bit like a gothic ladybird! It's rich and it's decadent. I did have some issues with the application on this one, but once I worked out how the polish preferred to be used, all was fine. 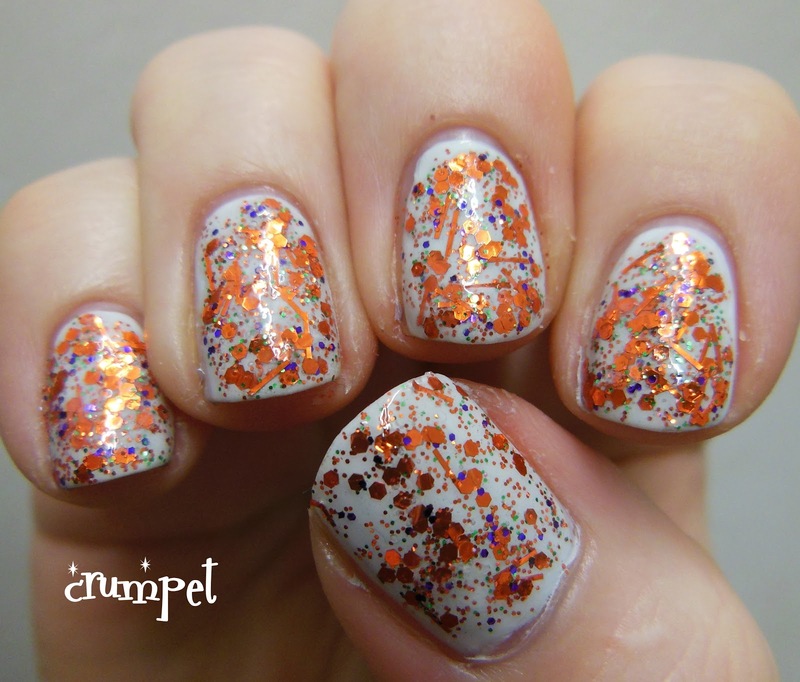 Zombie Kisses did NOT like to be swiped on to the nail AT ALL, so this was a dab job. As I said, a little annoying at first, but fine once it was behaving! 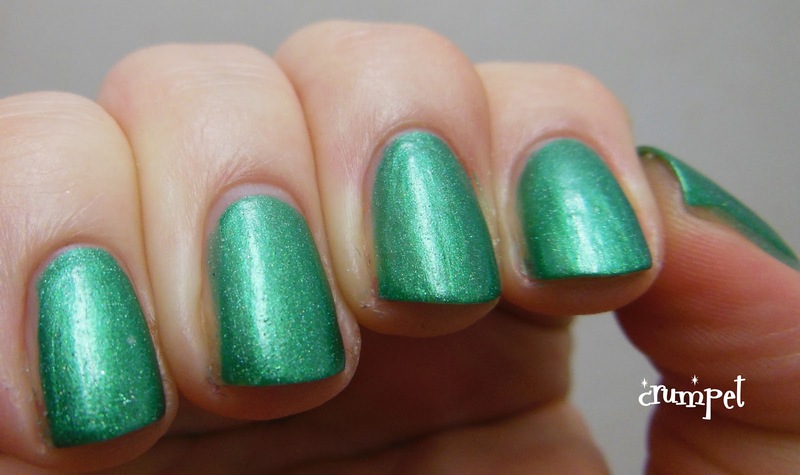 I then chose the green, Green Goddess. And actually, although I can't LOVE it (cos it's a green), I do like this a lot. 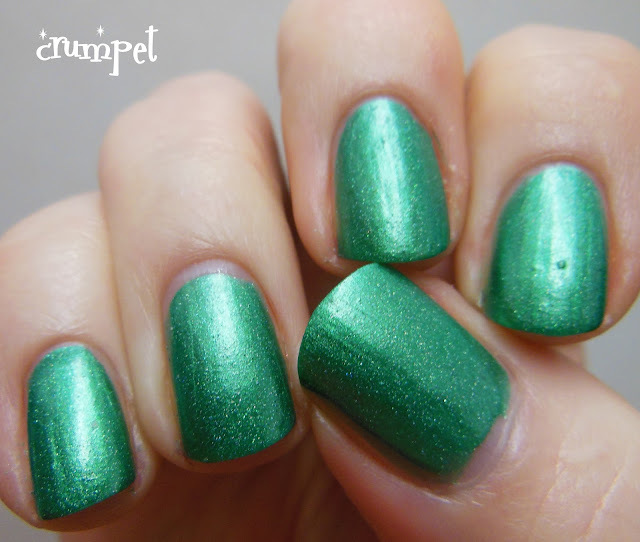 This is a very Christmassy shade of green, bright and emeraldy, and it applied beautifully. 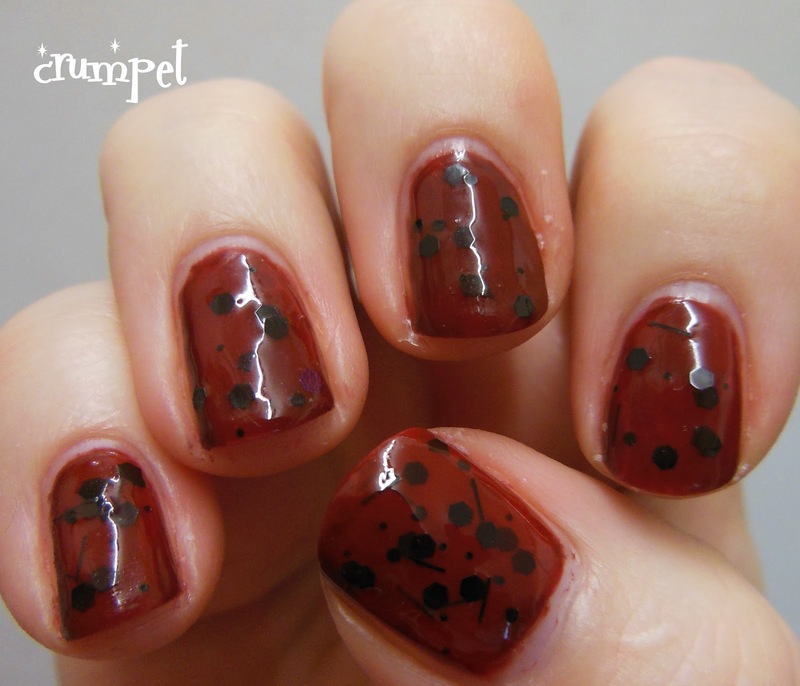 I deliberately didn't use top coat, as I liked the flat finish. I got quite a few comments on Indie Corner that a lot of you were interested in Indie Polish Makers who didn't just do glitterbombs - well here is your perfect example. 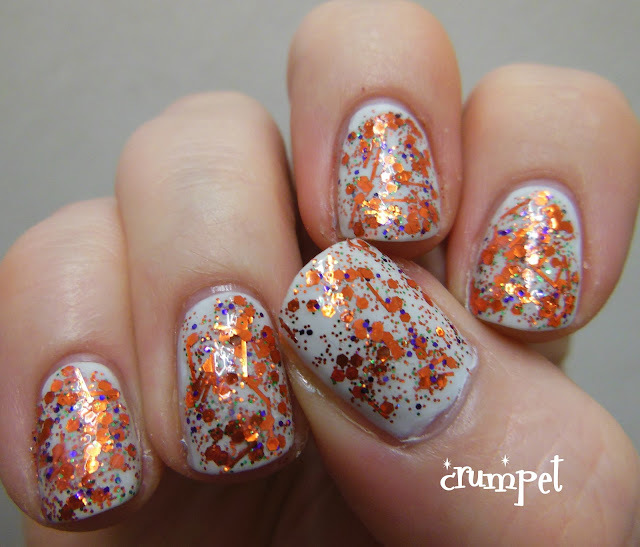 This is frosty, and very flat toned, but does have some hidden metallic sparkle too. This is different without being overly flashy. It's also a great colour and texture for nail art, so (surprise!) this one is actually going to be homed with my greens. Then I drew a deep breath and tried the lemon. Oh boy. 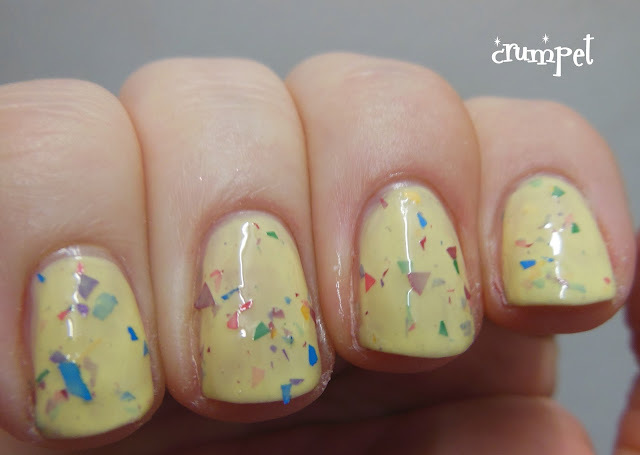 I HATE lemon and yellow polishes. 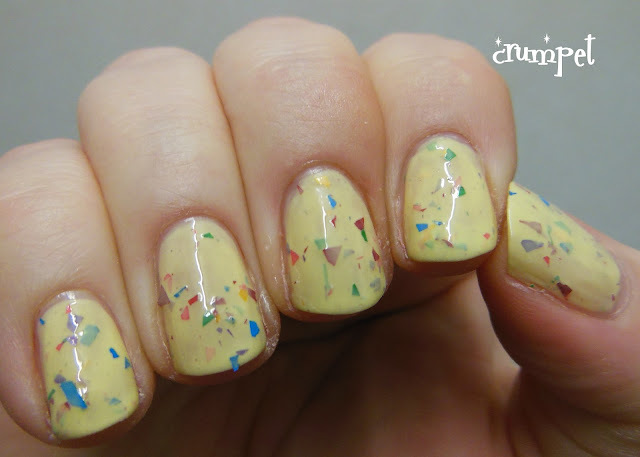 I can't wear the colour clotheswise, and I certainly can't bear it on my nails either! 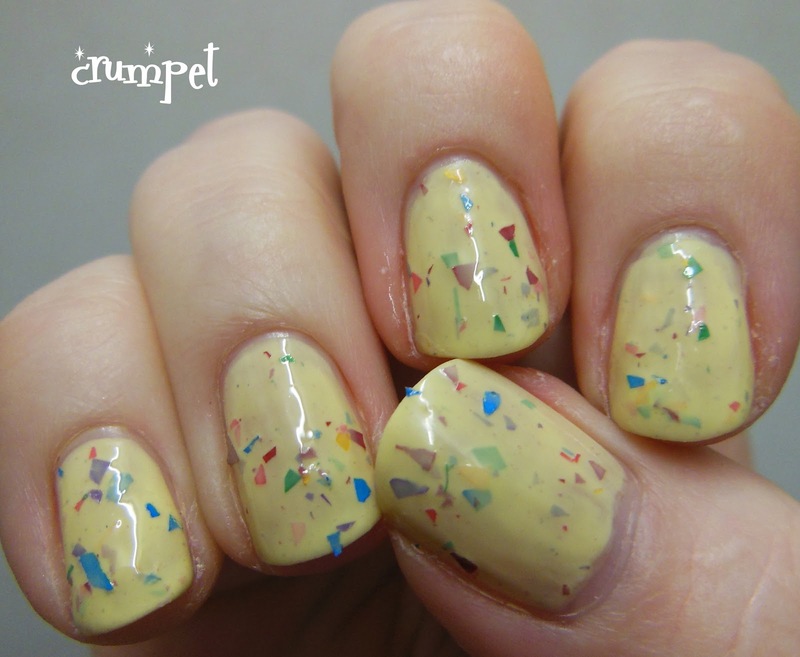 That said, The Scrambler - and how great is that name - is interesting, and is loaded with pastel glitter shards. I haven't seen a polish like this before. 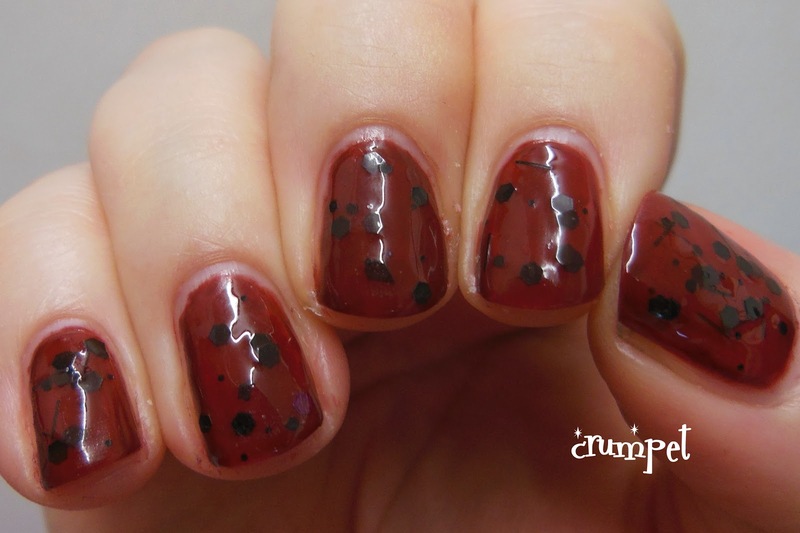 I didn't use undies, and I think this polish would have benefitted from them. 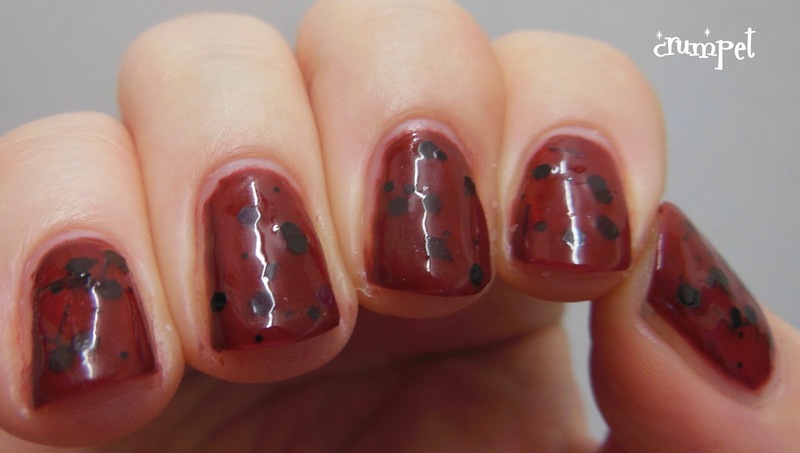 There is a little bit of streakiness in some of the photos, and I guess that's the trade off in trying to make a "jelly sandwich" polish. 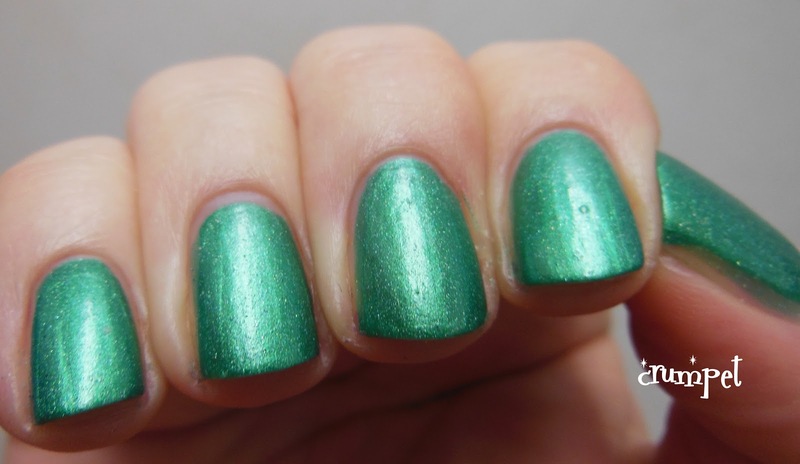 I think this polish will find a market (albeit never in Crumpetland), but I do find it a little odd that it's released at this time of year. This has spring and bunnies written all over it. So interesting, and GREAT name, but personally, not for me. Then I tried Bewitched. Oh la la! 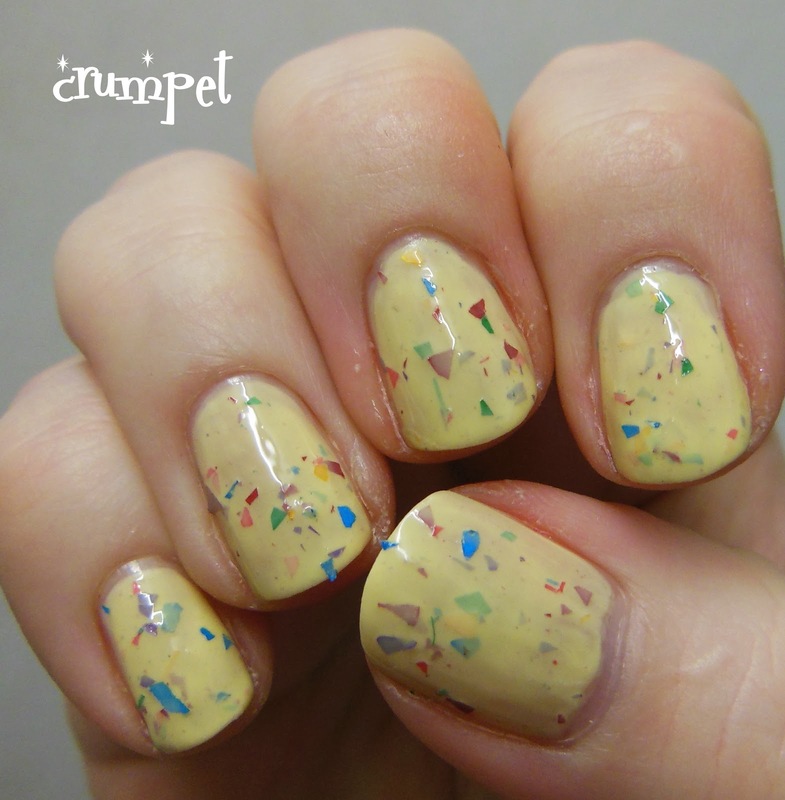 Crumpet LOVE this one! To be honest, I was a little bit jaded from all the Halloweenies, so I had really low expectations here, but wow, mind blown. Bewitched is a stunning orange and purple glitter, emphasis on the orange, but with just enough purple to throw it off balance. 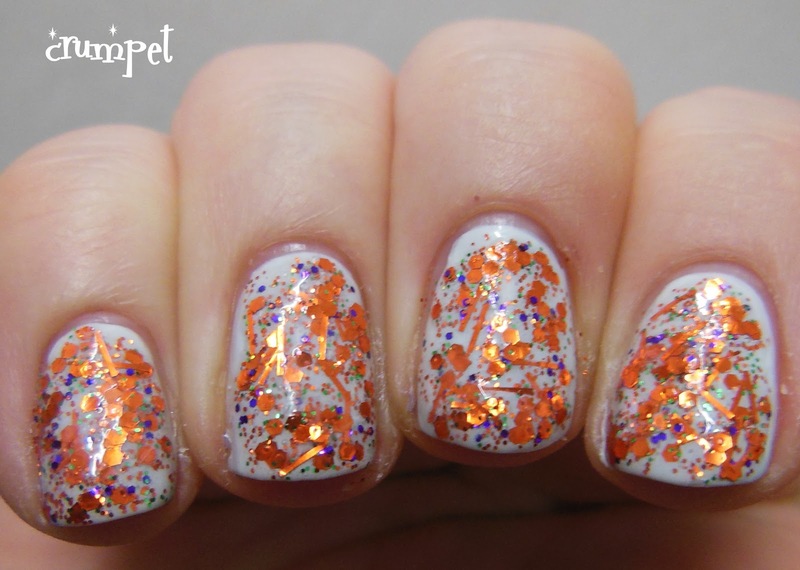 I layered it over OPI My Boyfriend Scales Walls to showcase the glitter. 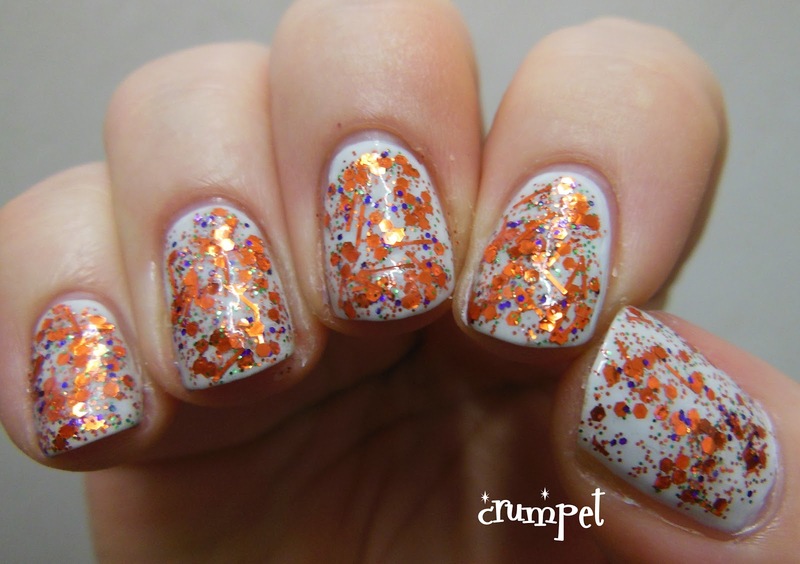 There is nothing I do not love about this polish. Fabulous. And finally, Toy's Story. This shares a lot in common with Green Goddess, but it's a little bit glitzier, like she's gone to the school disco. 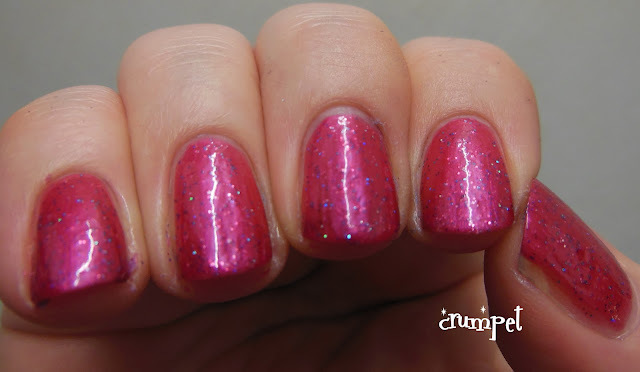 Toy's Story is a flat toned frosty polish, magenta-ish in colour, but also contains quite a lot of fine glitter. 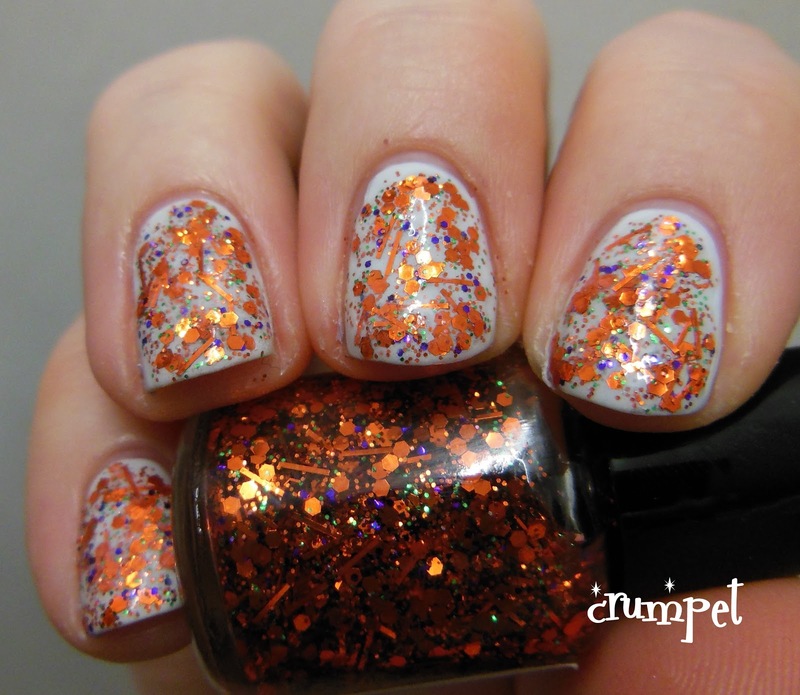 The glitter is (and I mean this in a nice way) like grit - being so microscopic, it really becomes PART of the fabric of the polish, rather than sitting on top of it, if that makes sense. I really liked this one, again for its "differentness" - in the polish universe, there aren't that many pinks which come in this texture. 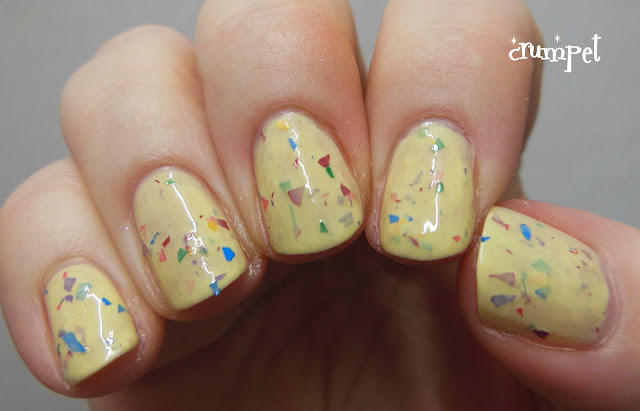 Lacquerhead Polish has her Etsy store HERE and her Facebook page HERE. Her polishes retail at $8 for a full bottle, and $4 for a mini. All of these polishes were sent to me for an honest review.